Inspired by the beauty and simplicity of monochrome style and the iconic IT Girls from the 60’s who helped shaped it. 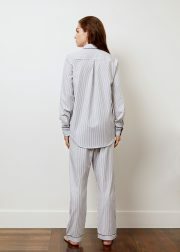 The Mia Pyjama Set features Black and White pinstripe, piping details, single pocket, mother of pearl buttons and contrasting print on cuff and collar. Blending classic tailoring with fresh detailing. 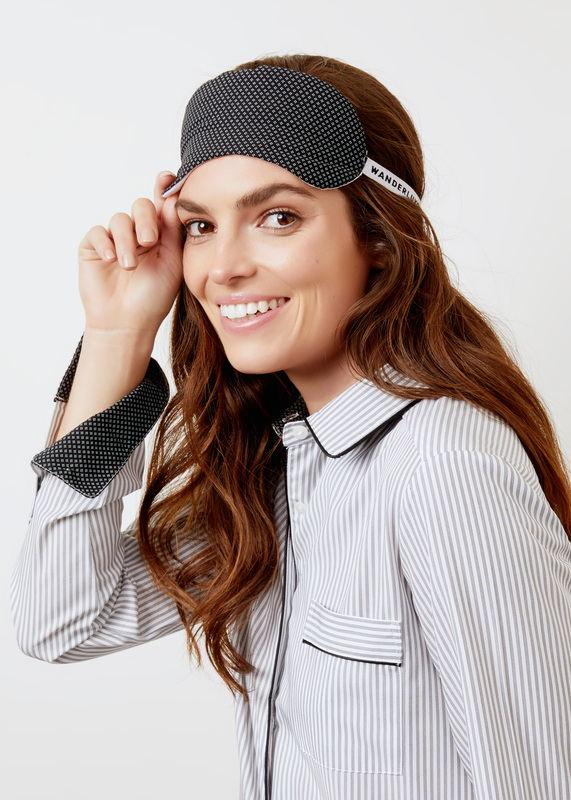 In true Wanderluxe style, the relaxed silhouette pays homage to men’s tailoring but is crafted especially for her, elevating and modernising this pyjama set. The pants come with a Black grosgrain ribbon drawstring and elastic waistband for a comfortable and flattering fit. Popular with our customers for its lightweight properties and luxuriously soft feel. Our exclusive fabric has become a signature of Wanderluxe quality. Perfect for lounging, sleeping and travel. Our pyjamas are designed for the bedroom and beyond. Embroidery Letters * 10 characters remaining Enter the letters for your Embroidery (capital and lower case up to 10 letters). All embroidery will be positioned above pocket. The characters will be embroidered exactly how they are written – capital and lower case. There’s something alluring about a girl wearing 'his' shirt. When designing our Night Shirt we wanted to recreate the feeling of putting on a man’s shirt – how the oversized cut serves to accentuate women’s curves and petiteness for a relaxed fit. Creating the ultimate ‘his shirt for her’ in the process. Inspired by the beauty and simplicity of monochrome style and the iconic IT Girls from the 60’s who helped shaped it. The Audrey Pyjama Set is the ultimate in understated glamour. Featuring a Silver and cool Grey geo print with a silky finish, pocket and piping details to give this Set a sleek and refined feel. The pants come with a Charcoal Grey grosgrain ribbon drawstring and elastic waistband for a comfortable and flattering fit. Inspired by the beauty and simplicity of monochrome style and the iconic IT Girls from the 60’s who helped shaped it. The Mia Boxer Set features Black and White pinstripe, piping details, single pocket, mother of pearl buttons and contrasting print on cuff and collar. Blending classic tailoring with fresh detailing. In true Wanderluxe style, the relaxed silhouette pays homage to men’s tailoring but is crafted especially for her, elevating and modernising this pyjama set. The shorts come with a Black grosgrain ribbon drawstring and elastic waistband for a comfortable and flattering fit. Inspired by the beauty and simplicity of monochrome style and the iconic IT Girls from the 60’s who helped shaped it. The Edie Pyjama Set evokes a feeling of luxury and confidence. Masculine tailoring is contrasted with a feminine and playful star design. The shirt features classic lapels, pocket and piping details to give this fun set a sophisticated feel. The pants come with a White grosgrain ribbon drawstring and elastic waistband for a comfortable and flattering fit. © 2017- Wanderluxe Sleepwear - All rights reserved.